Taffeta Labels are made on a coated nylon or polyester material . These labels are the cheapest and also offer good barcode scannability. These clothing labels can be customized with your logo & data. Keeping in mind ever-evolving requirements of our respected clients, we are manufacturing a premium quality range of Taffeta Sticker. Alluring lookPRICE RANGE 20p - 2 rs. Our customers can avail from us attractive Taffeta Print Labels at affordable prices. These prints are in accordance with the set industry quality standards and guidelines. Apart from this, we have hired skilled and experienced quality controllers, who check the quality considering various parameters. .
We offer services for Taffeta Labels to the clients. The labels, we deliver are self adhesive and are used for several industrial purposes. Based on the client's requirements, these labels are delivered in various sizes, shapes and colors. These labels adhere to set industrial standards and are delivered at highly competitive prices. 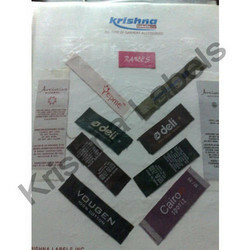 Being a leading firm in this industry, we are offering a high quality range of Taffeta Label. Our premium collection of plain taffeta labels are manufactured using a plain garment, which is weaved across the warp and weft. Specially designed for our most demanding clients, these labels are highly durable and can be availed at most competitive prices. We believe in quality and in-time delivery. The labels offered by us are widely used in the textile and apparel industry. Our premium collection of taffeta labels are superior in quality and attractive in design and are manufactured using different types of fabric which is weaved across the warp and weft. These labels are highly durable and have high resistance to steam pressing and dry cleaning. We offer these labels to our valuable clients in different colors and sizes at industry leading prices. We are engaged in offering a quality approved range of Stylish Taffeta Label.